The People’s Republic of China officially broke ties with South Africa, after some apparent hesitation, in 1960 and resumed them only in 1996, after the end of apartheid. The official story—and the line promoted by most Chinese academics—is that China was a staunch opponent of racist South Africa. In fact, China’s relations with South Africa during apartheid were much more complex. It is not necessary to rehearse here the fact that China stood accused of splitting the liberation movements across Africa into pro-China and pro-Soviet camps. In South Africa, this meant that Beijing supported the Pan Africanist Congress, an organisation whose members used the slogan “One Settler, One Bullet”. Walter Sisulu, then Secretary-General of the African National Congress noted that China’s ally in South Africa practised ‘inverted racialism, foreign to the spirit of and traditions of the African people’. Interestingly, during the mid-1970s there was a brief period when Pretoria flirted with the idea of establishing ties with China, on the basis that South Africa’s main enemy was Moscow, as was China’s. The development fell through after hostile reactions from the South African press. That China was open to links with South Africa, purely based on combating the Soviets, is thought-provoking. The fact that Beijing was forced to publicly deny that Chinese leaders planned a visit to South Africa in 1980 suggests that there was indeed substance to this story. More importantly for this article, however, a recent book by Hennie Van Vuuren, Apartheid Guns and Money: a Tale of Profit, published in South Africa, has, in fact, revealed a level of duplicity hitherto unknown. Evidence found in recently declassified South African intelligence documents have shown that Beijing was supplying Pretoria with military equipment from at least 1980 onwards and that before the end of apartheid, China was actively pressing for trade relations with South Africa, then under international sanctions. This, and evidence sourced from elsewhere is the subject of this article. The documents reproduced in the book show that a secret arms trade between China and apartheid South Africa started in the early 1980s, with China given the codename of “Hansa”. South Africa’s military and an Armscor front company expedited this illicit relationship. Weapons were sent by Norinco, China’s massive military industrial corporation, to the South Africans and then onto Pretoria’s allies, namely UNITA in Angola and RENAMO in Mozambique. One document records that Chinese-made AK47s, rocket launchers, 20,000 rounds of ammunition, and 200 250kg artillery shells made up one such transaction. A secret Foreign Affairs document dated 2nd March 1983 describes how Zaire’s Mobutu Sese Seko (for a fee, naturally) provided end-user certificates falsely claiming that Kinshasa was the final destination for the arms. Adam Export, an Armscor front company registered in Geneva, was utilised to hide South African participation. Two South African citizens, “employed” by Adam Export and ostensibly acting on Zaire’s behalf facilitated the contract with Norinco. In a further act of subterfuge, the shipments generally went from Shanghai to Matadi port in Zaire. The weapons were not offloaded in Matadi however, bur rather then sent onto Durban under the cover that the ship was carrying coffee destined for Maputo in Mozambique or were bicycles, cooking equipment and ploughs ordered by a Pretoria-based front company called Rust Enterprises. Furthermore, in the mid-1980s, James H Guerin, a former CIA agent, and head of International Signal and Control (ISC), pleaded guilty to shipping missile technology to Armscor 1984 and 1986. Armscor then developed this technology to produce the ZT3 laser-guided anti-tank missiles and in turn sold this on to China. A document from 1987 reveals that communication between Kentron (an Armscor subsidiary) and ISC was routed through Armscor’s Hong Kong regional office. Norinco later developed the Hong-Jian 9 missile system in 1990, which is very similar to the ZT3. Apart from the illegal arms trade, China was engaged in sanctions-busting trade with South Africa. In 1982, the Far Eastern Economic Review reported that China was buying uranium from Pretoria. A Chinese delegation secretly visited South Africa in 1988 and declassified materials confirm that the then Minister of Trade and Industry, Danie Steyn, ran a sanctions-busting unit and sent a Top Secret note to PW Botha discussing how clandestine trade between China and South Africa was developing rapidly. Chinese contacts with South Africa, especially that of a commercial nature, increased in frequency in the early 1990s. In May 1991, the South African Foreign Ministry was forced to deny that a secret visit by PRC officials to South Africa had taken place. As a South African newspaper, The Star remarked, the visit reflected China’s ‘determination not to let ideological scruples get in the way of commercial benefits’. In addition, reports from Hong Kong indicated that China was importing iron ore from South Africa claiming that it was from Australia. In October 1991 South Africa’s Foreign Minister Pik Botha visited the PRC, the first South Africa Minister of Foreign Affairs to do so. A business delegation from South Africa accompanied Botha, representing large South African commercial companies. Whilst these business contacts were being made, China was busy congratulating the ‘ANC’s show of pragmatism, which is a manifestation of political maturity’. 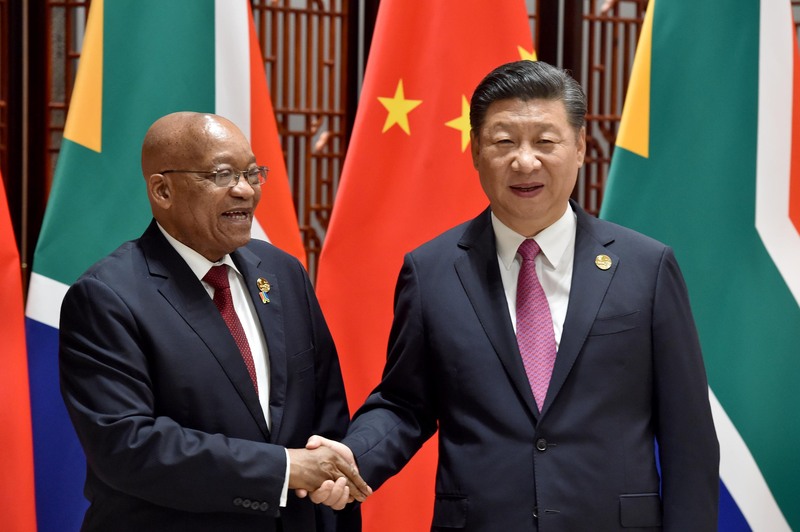 Questioned as to the morality of trading with South Africa, China disingenuously pointed out that a recent Commonwealth summit had not “mentioned” sanctions, and so Beijing felt justified in developing these linkages with Pretoria. As a result, China’s Foreign Minister Qian Qichen met his South African counterpart in January 1992 at Johannesburg’s international airport whilst en route to Zimbabwe. At the same time, it was confirmed that the PRC had an “interest section” under the auspices of the Centre for African Studies. The first official Chinese trade delegation visited South Africa in February 1992, and in July an eight-man Chinese trade delegation visited with the intention to secure contracts with South African suppliers of iron ore, industrial diamonds and paper pulp. It should, of course, be pointed out that China was by no means a key supporter of apartheid South Africa. Its trade with the racist regime was small and covert (though by its nature, we may never know the true amount). Western countries such as France and the United Kingdom had much more developed links with South Africa, as did the United States and it was those countries that fought tooth and nail to protect their political and economic interests in South Africa and in doing so no doubt prolonged apartheid. However, what Hennie van Vuuren has found, alongside other evidence shows is that China’s claim to have been a resolute and righteous opponent of apartheid South Africa is destabilised. Like all other countries, interests often contradict lofty principles. Ian Taylor is Professor in International Relations and African Politics at St Andrews University and Chair Professor in the School of International Studies, Renmin University, China. Image credit: CC by GovernmentZA/Flickr.